Monitor your web metrics to grow your online presence! Track Unique Visitors, Referrals, Bounce Rates, Conversion Rates, Top 10 Pages and more - all in one place! Bring website intelligence into your everyday decision making processes to accelerate the growth of your business. Imagine, for a second, you own a traditional brick-and-mortar store. But it’s not just any store. This one is equipped with a special tool that tracks nearly everything that goes on inside: How many people walk through the door, which products they pick up – even the marketing campaigns that drove them to arrive at the store in the first place. It doesn’t take much imagination to envision how this could be put to use to drive sales. The spend on underperforming ads could be redistributed to more effective tools. A high number of store visits in combination with low sales – a sign that people are visiting the store but not taking much interest in what you have for sale – might force you to revisit your product selection - what you're currently doing may not be working. A dip in visitors might have you calling city hall to ask about the construction which is cutting down on parking in the area. This, in a nutshell, is what Web Analytics is for your online ecommerce storefront: A tool that gives you essential information about how users are interacting with your website. How many people are visiting, which search terms or link address are they clicking to arrive at your site, which conversion actions are they taking – these are the helpful insights you can get from web analytics. Why build a custom Web Analytics report? The need to track all your key performance indicators and metrics relevant to your business, department, or specific campaign has never been more important. Through the use of data visualizations, interactive reports you can simplify complex data sets to provide team members, management or even clients with an at-a-glance overview of current performance from any timeframe - be it real-time, weekly, monthly, quaterly, annualy, etc. See our complete list of App Integrations. Foster a culture of transparency and collaboration with Klipfolio reports. We offer a wide range of report sharing capabilities to give you the flexibility to easily share data in real-time, ensuring your team is always on the same page. You can share access to your web reports and Klips with the click of a button; generate a URL or create a download of your data visualization content as images or PDFs for one-time sharing across social media and messaging platforms. Set up scheduled email snapshots or reports based on individual data visualizations or entire reports. Choose the distribution list, timing, and frequency rate of email updates. Embed your customized data visualizations into your website or host application, or show off your masterpiece and opt to make your dynamic and interactive web report public. Do you use Google Analytics for your website reporting? At Klipfolio we understand how valuable your time is. Daily, weekly, monthly, quarterly and year-end reporting can be tedious, which is why we’ve made it easy for you. With Klipfolio, you can export your data insights to be included in your reports instantly. You'll save your time and money. Looking for more from your Google Analytics data? Klipfolio has you covered with its Google Analytics reporting platform. Build the custom data insights and visualizations you need to help track and monitor the performance of your business, without the hassle of repetitive data diving. Interested in building Google Analytics reports but are unsure about how to get started? We can have you up and running in no time. 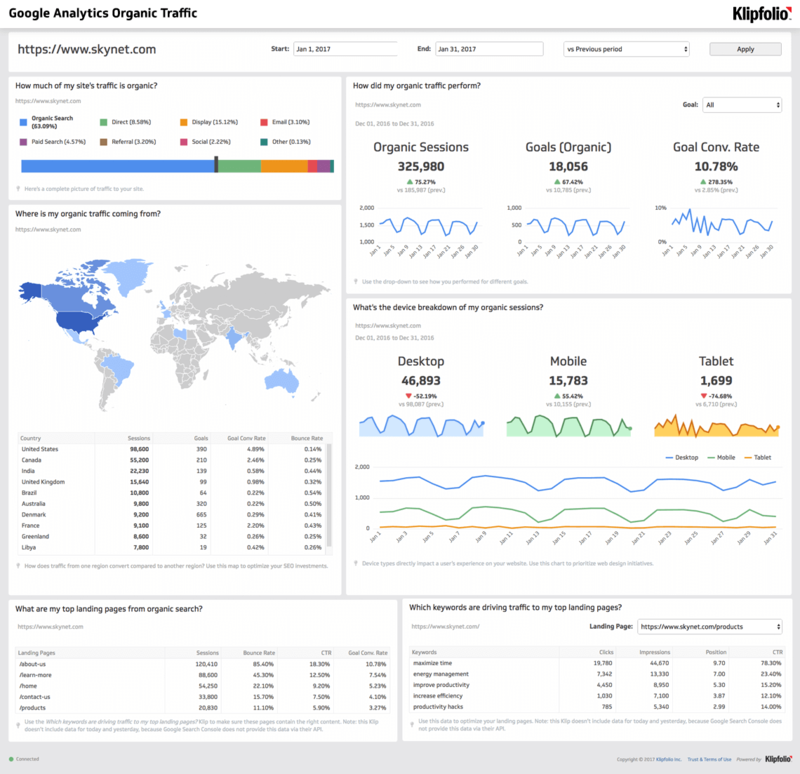 Klipfolio offers pre-built Google Analytics report templates that will get you on track. We also offer a seamless integration with Google Analytics, meaning all you need to do to start pushing your data to Klipfolio is log into your Google account. Easily integrate your Google Analytics data with Klipfolio to build any custom data visualization that you need.